Writer Al Ewing sends the Royal Family on an odyssey for survival! The Inhuman Royal Family has emerged from a bitter war against the X-Men and Thanos only to lose their powers and doom their race to extinction—but hope remains. In ROYALS #9, legend states that seven Inhuman Royals will journey into the unknown to find the Progenitors of their race, learn a lost secret that will save them all—and that while seven leave, only six will return. On October 4, writer Al Ewing and artist Javier Rodriguez send the Royals on a search set to test the mettle of their family and shape the fate of their people. We spoke with Al about the challenges ahead. Marvel.com: What can you tell us about the plot of issue #9? Al Ewing: I could mention the World Farm. The moment when we finally reveal the World Farm—the Progenitor base of operations out beyond the far edge in the darkness between one galaxy and the next—will be one of the most visually spectacular moments of the year. The Progenitors are, at the very least, a Type Two civilization on the Kardashev scale—maybe even a Type Three, as we’re only seeing an outpost of theirs. (If you’re curious about the Kardashev scale, Wikipedia is your friend!) Suffice it to say, these are big, big dudes, and that’s going to be represented visually thanks to the amazing work of Javier Rodriguez, [inker] Alvaro Lopez, and [colorist] Jordie Bellaire in ways that will blow readers’ minds out of the backs of their skulls. And from there…I’ll just mention “Judgement Day” and leave it at that. No Inhuman deed goes unpunished. Marvel.com: What are the family dynamics within the Royal Family like right now? Al Ewing: They’re all over the place! Medusa and Black Bolt are each on their own journeys—you can see Black Bolt’s over in BLACK BOLT, which everyone should be reading—and when they see each other again, they’ll have gone through some…changes. Meanwhile, the other Royals are dealing with going further and further away from home in different ways. Some are missing the people they left behind, others are drawn to what’s waiting for them out there, and they all have their own agendas. Marvel.com: Why are the Royals looking for the Progenitors? Al Ewing: They’re looking for Primagen—the prima materia of Inhuman chemistry—the original philosopher’s stone from which Terrigen (the crystals that gave Inhumans their powers, until they were destroyed recently) can be derived from. This isn’t a Holy Grail type of quest, exactly; there isn’t just one piece of this stuff. The Progenitors have plenty. This feels more like the Promethean myth—or Jack stealing the giants’ gold. It’s a quest into the halls of a science-fiction Olympus to steal a handful of fire and bring it to Earth. But, just like Zeus did not intend men to have fire, the Progenitors aren’t happy with the wayward products of an old experiment (the Inhumans) stealing even a handful of their power. There will be consequences. 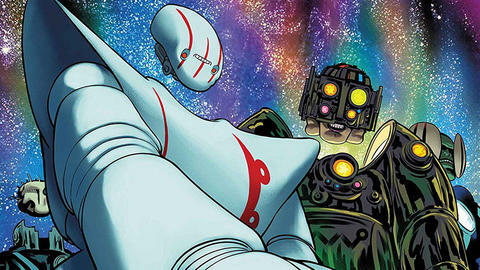 Marvel.com: Walk us through the process of creating the Progenitors. Al Ewing: It started with the basic idea of a new alien mega-civilization—creatures who could be truly worthy of being the creators of one of the oldest and most advanced alien races in the Marvel Universe. I gave a couple of fairly basic design notes to Javier…I think really I just gave him the relative size and maybe one visual signifier, and he did all the rest. He came back with all manner of different designs, and we very quickly decided that instead of choosing one, we’d just use them all and have different “classes” or “types” of Progenitor for different tasks. That inspired more of their society and how it works. We ended up with something a little different to the other Marvel aliens—creatures that fill a specific niche. I think they’re here to stay. Marvel.com: How does Marvel Boy fare in all of this? Al Ewing: Well, Marvel Boy’s been around since issue #1, but after events that unfold in the latest issue of ROYALS (issue #7, which drops tomorrow), he’s in a better position to understand the Progenitors and what they want. And there’s another of the Royals who’ll be affected by the Progenitors in a way that I won’t spoil, but it will leave them significantly altered now and in the future. Marvel.com: There’s an ominous promise: one will die. What inspired that? Al Ewing: It’s a very mythical kind of beat. One of the things I wanted to originally go for with this series was to create a kind of “myth from the future”—a science-fiction quest based on the classical Argonauts/Prometheus model. 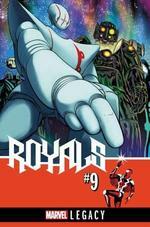 Join the search with ROYALS #9, by Al Ewing and artist Javier Rodriguez, on October 4!